The Annual General Meeting of the Indian Pump Manufacturers’ Association (IPMA) took place on the 6th July, 2018 at Hotel Vivanta, Pune. The meeting was attended by IPMA members; associate members and a few invited guests. Mr. Rajeev Jain (Managing Director of KSB Pumps Ltd.) was the Chief Guest and the key note speaker on the event. This event was also graced by some eminent personalities from the Pump Industry like Mr. Sanjay Kirloskar (Chairman and Managing Director of Kirloskar Brothers Limited), Mr. Kishor Desai (Managing Director of Kishor Pumps Pvt. Ltd.), Mr. Harshad Joshi – Managing Director of Pluga Pumps and Motors Ltd.; Mr. V Krishnakumar (President – SIEMA), Mr. Premanand Bhat – President - IPMA etc. Mr. Jain, in his key note address, mentioned the importance of digitalization in the manufacturing sector and the need to implement the same in our regular business practices. He emphasized it is all about speed of perception, definition and delivery; which are the key stones for sustained success. It’s all about how to improve Customer Experience (CX), he added! According to Mr. Jain, and as the first observation is that several of the traditional “blue-collar” industries, such as our very own pump industry, are simply not able to attract sufficient young talented people. As a result, the average age keeps creeping upwards. It became obvious that one of the key reason a lot of Millennials are seeking companies like Google, Tesla, TCS, Infosys, Amazon and other tech companies has essentially little to do with what they do, but more so how they are perceived in the public mind. 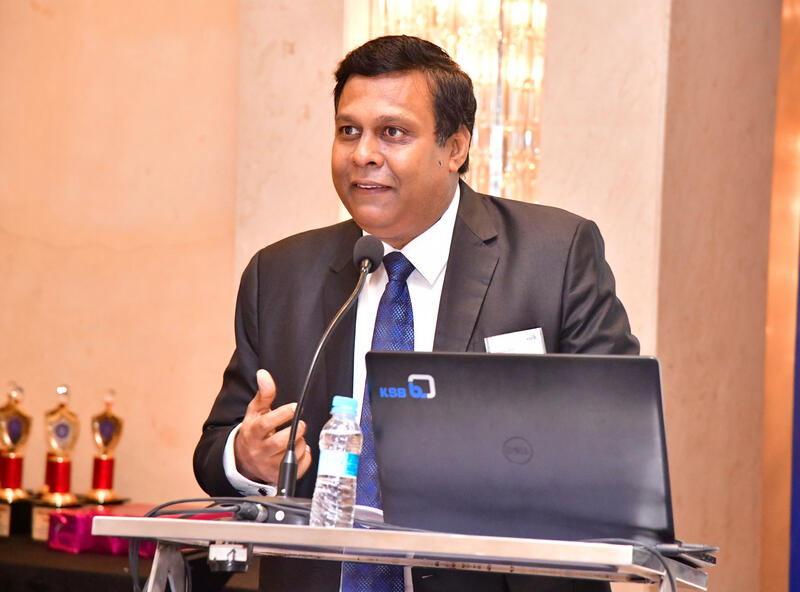 Mr. Jain mentioned; of how KSB is focusing on the growing need of Internet of Things (IoT) in its day to day operations, encompassing sales processes; HR; operations and aftermarket operations; and also interactive portals for dealers and vendors which is considerably easing out its employees’ lives at work and also helping KSB’s growth. The IoT is the network of physical devices, vehicles, home appliances, and other items embedded with electronics, software, sensors, actuators, and connectivity which enables these things to connect and exchange data, creating opportunities for more direct integration of the physical world into computer-based systems, resulting in efficiency improvements, economic benefits, and reduced human exertions, Mr. Jain explained! From the customer experience perspective, Mr. Jan elaborated “Our basic mantra on a Global level covers 3 facets of Digitalisation which is external, i.e. to offer the best Customer experience, secondly to boost the efficiencies along the value chain internally and lastly enable our products to support Digital business concepts”. To push this Digitalization process within the KSB group, worldwide, Mr. Jain elaborated on an innovation laboratory with dedicated and a qualified team, that has been set up in Germany. He added, “These teams are involved to evolve Customer centric + agile development of radical or disruptive business models”. He also explained the various applications and breakthroughs’ made by this innovation cell including Noise Monitoring over a smart phone of a pump or any rotating equipment; how a service specialist sitting in his office can see and advise his engineer at a remote site location by wearing special goggles; or even the technology developed which is Industry 4.0 ready and a technology that leverages individual fixed speed to make the variant complexity of standardised pumps; amongst other state-of-the –art tools! He ended his address by saying “It is up to each one of us in the industry to enhance customer experience through embracing digitization and artificial intelligence! I agree, some solutions could see success and some not; however, it is sacrosanct that we need to move in this direction to do better; to ensure that we morph to an even better future as an Industry”. Mr. Bharat B Patel (Member of the EC – IPMA), presented the list of initiatives taken by IPMA during the recent past including some notable CSR activities that the association has embarked upon. Mr. Yagnesh Buch (Past President – IPMA) discussed the steps and activities needed to enhance - Brand IPMA; in order to make a considerable impact of the Association in India as well as the world over! Mr. Jain felicitated those who were actively involved in the Associations activities in the year gone by handing over mementoes. Every participant showed a positive sign of satisfaction at the end of the evening. This event was sponsored by KSB Pumps Ltd and concluded with dinner.